The doctors were reluctant to let me bring her home at age 2. They were afraid she wouldn't live to see her third birthday. They asked me if I knew of a good 'facility' for her. They kept saying things like, "You know she'll never walk", "You know she'll never be able to communicate with you or anyone else", and "You know she will be a huge burden to you and the rest of your family." When I bundled her into her car seat and drove toward home, I saw them in my rear view mirror just shaking their heads. Well, you know what, doctors? You couldn't have been more wrong. She did walk. In fact, in the second grade she got sent to the principal's office for running in the halls. She does communicate quite well. Just ask the teacher that she continues to call a 'b*tch'. She is without a doubt communicating. And a huge burden??? She is the light of this family. She is our glue, our reason for getting up every morning. Her smile makes everyone one of us smile back, and the touch of her hand is like angel kisses. Not I, not her sister, not her three brothers would ever, ever consider her a burden. Oh, and one other thing - she did live past her 3rd birthday. On Monday, my beautiful Ashley turned 15 years old. She is every bit a teenager. She is strong and willful, opinionated and defiant. She is beautiful and loving and one of the most caring people I have ever known. She is perfect, and you, dear doctors, have absolutely no idea what you missed when you turned, walked away and shook your heads. There are some very good and caring people in this world, and I have been blessed to meet so many of them. I met another of life’s angels this past weekend. If you checked out the link to the newspaper story about Ronnie coming home last week, you may have noticed that there was a side bar that mentioned our need of a handicapped accessible van. When I knew Ronnie would be joining our family, I began checking out vans, and quickly found that the high price tag was too much for me. Even the used vans with high mileage were still in the $30-40,000 range. I could get a ten year loan for one, but just the thought of paying $500-600 a month for the next ten years made me physically sick. I even doubted that the vans I saw would last 10 years. What I did instead was install a wheelchair carrier on my car. It’s not an ideal solution, but it also wasn’t a ten year expense. I got a grill cover to bungee over the chair when it rains, and things have worked out so far. But a van would still be a better solution. After the article appeared in the paper, my social worker received several phone calls from folks who had used vans to sell. Most were like the ones I saw at the van dealers – old and with high mileage. But one was different. The Tate family called about their van and it sounded perfect. Although it is 10 years old, it only has 30,000 miles on it. The Tates bought it from an older couple who had hoped to travel in the van, but things didn’t work out. Mr. Tate had the original window sticker from the van and it cost $60,000! The Tates bought it, installed a large lift on the rear of the van, and have used it for several years now. But, their circumstances have changed and they are looking for a new van. Mr. Tate called my social worker and said I could have it for the amount of the loan payoff – just $12,000! 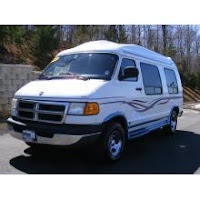 The van is a Dodge high top conversion van with leather, heated, and vibrating seats. (Why does someone need vibrating seats in a vehicle?). It has a TV and a VCR, which Chip thinks he can switch to a DVD player. It’s huge and has more than enough space for my family, and the lift on the back of the van could probably lift my whole family standing on it! I still have to work out financing, and am hopeful my loan request will get approved. If it does, life will get a lot easier for all of us, all thanks to the Tate family! Ashley, like Ronnie, is deaf, but she is also blind. So, whenever she had doctor's appointments, I would act as her interpreter. 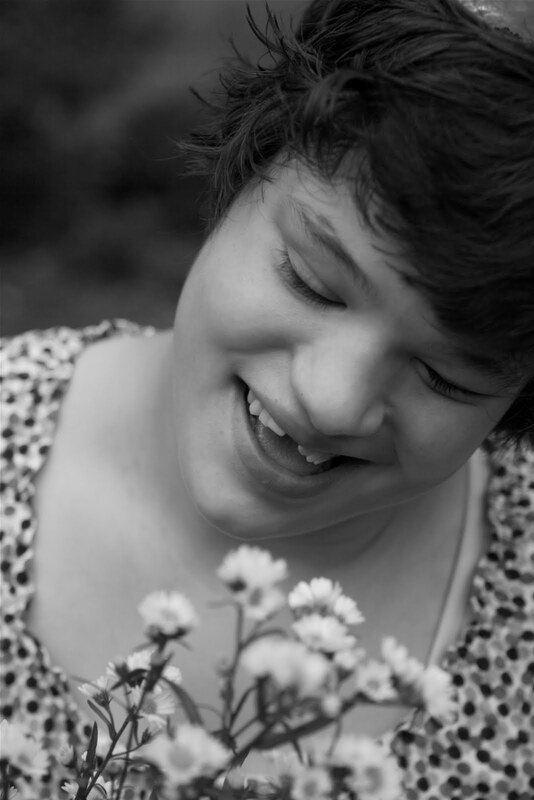 Finding an interpreter for a child that is deafblind is almost impossible. And, it never really crossed my mind that I could ask a doctor's office to provide that interpreter. But I called today to make an appointment for Ronnie to see a urologist, and the appointment scheduler asked me if we needed an interpreter. My initial instinct was to say no, that I would perform that function. But before I actually said that, I changed my mind. I decided that it might be easier for me to concentrate on what the doctor was saying if I could really listen, and not try to interpret at the same time. And, I think I would be more likely to forget any questions I might have if I was having to listen, interpret and think simultaneously. I'm pretty good at multitasking, but I know my limits also! So now I'm thinking that I will ask for an interpreter for any and all appointments for Ronnie. Have any of you run into any problems making this happen with your doctors? Does it make sense that I should do this? I promise to stop gushing abou Ronnie soon, but you Moms know what it is like to have a new child! A reporter and photographer were on hand the day that Ronnie came home, and did a wonderful story in our local paper. Thought you all might enjoy reading it! Ronnie's home, and appears quite content. Of course, he is just like my other two boys - give him a video game and life is good!! In just a couple of hours, his wait and ours will be over! Welcome home, Ronnie! Where Are The Ice Chips? I’ve been in labor all weekend. Not the kind that I experienced 19 years ago with my oldest son – but labor nonetheless. Johnny is coming home on Tuesday. I’ve spent all weekend and several weekends before that getting his bedroom ready, living through a bathroom remodel, trying to get school services in place, locating all the doctors and therapists he will need, buying the foods and drinks he will need, and searching for a vehicle solution that will accommodate his wheelchair. I’m exhausted. But there is one more task left to complete. Monday night, the night before I become a mother of five not four, I will go and buy a bunch of balloons and make a welcome home sign to surprise him as he and his social worker pull into our driveway at 11am. I will make sandwiches and cookies to serve for lunch to the two social workers, the foster parents, and Ronnie. I will have all his clothes washed and hung up and his bedroom ready, including the Incredible Hulk perched on his pillow! Wish me luck! It’s almost time to push this baby out, and then the real fun begins! I wrote both in January and February about the budget woes faced by my homestate, Virginia, and how much of the budget balancing was being done by cutting services to people with disabilities. Last Sunday, our General Assembly passed the budget bill, and although things were not as bad as expected, they are still not good. I also worry that unless the economic situation in both Virginia and the rest of the country improves, this might just be the tip of the iceberg. The Conference Committee completed their work yesterday and just a few hours after their report was printed, the General Assembly passed Virginia's 2010-2012 Biennium Budget. 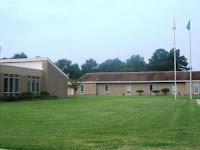 • $23 million to rebuild a 75-bed institution at Southeastern Virginia Training Center in Chesapeake. • $24 million to renovate Central Virginia Training Center, an institution in Lynchburg. • 750 ID Waivers and 134 DD Waivers eliminated (this would make 4 years of no new DD Waivers). *-Restorations dependent on FMAP funding. Like many other items in the budget, these restorations are contingent upon a 6 month extension of the enhanced FMAP (a temporary increase in the federal share of Medicaid spending). On Thursday of last week, the U.S. Senate passed the FMAP extension, which was included in the American Workers, State, and Business Relief Act of 2010 (H.R. 4213), by a vote of 62-36. The U.S. House of Representatives has not yet decided on whether to adopt the Senate bill or develop its own bill, which, after passage would be conferenced with the Senate bill. The budget bill now goes to Governor McDonnell for his review. The Governor has the ability to propose amendments to the budget before the General Assembly's veto session on April 21st. I hope and pray that things do not get any worse than they already are...both in my state and in yours. Many, many parents of children with Autism believe that an additive in childhood immunizations caused or had a negative influence on the development of their children’s Autism. Over the last several years, there have been many heated debates on the subject. Doctors repeatedly tried to reassure parents that the immunizations did not cause Autism and that the children were at extreme risk by not getting the shots. 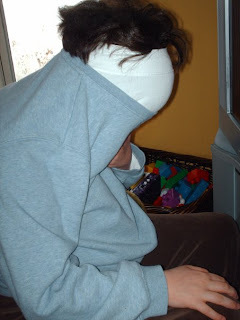 Parents had circumstantial evidence – their children were fine before the shots – afterwards they watched their children slowly regress and turn their focus inward. The circumstantial evidence has often been quite compelling. But on Friday, March 13th, A special federal court ruled that the vaccine additive thimerosal does not cause autism. The ruling, which came in three separate cases, follows a parallel ruling in 2009 that autism is not caused by the combination of thimerosal with the measles-mumps-rubella (MMR) vaccine. The rulings follow the same court’s judgment last year against claims that measles-mumps-rubella shots in combination with other thimerosal-containing vaccines cause autism. And they reinforce many comprehensive scientific studies, including one from the Institute of Medicine, that have ruled out any causal link. Autism is a frightening diagnosis that puts enormous burdens on families, but blaming vaccines without evidence only harms other families who might be frightened enough not to immunize their children. The fate of children with autism would be far better served if the activists who have devoted their resources to lawsuits would support research to discover its true causes, and to helping those children realize their full human potential. I have to wonder if any of the folks on the editorial staff have children with Autism, and if not, I wonder if their opinions would be different if they did. How do you feel? I do worry about parents not immunizing their children, but some of the circumstantial evidence I have seen and read about is compelling. Should there be more studies, or should we all put this immunization/Autism link to rest and concentrate on research as the WSJ editorial suggests? What do you do when the dentist is 45 minutes late? All I can say is that I am very grateful for my cell phone that can play Nickelodean videos! What do you do if your child comes home from school with bruises, scrapes or other injuries that they didn’t have when they left for school? When my son without disabilities was in elementary, middle and high school, I would just ask him if he came home with injuries – and he would tell me what had happened. But for my children with disabilities, it’s a different story. Jessica, for instance, can relate a story, but often that is just all it is. It’s difficult for her to remember what happened an hour before my asking, much less earlier in the school day. And, if someone at school or on the bus tells her to stop being a baby, or that the injury is not a big deal, she will say nothing at all. I also have a tough time getting an answer from Ashley. She’s so used to bruises from running into things, that I don’t think she thinks twice about it. But very often the bruises I see at the end of the school day are obviously not from running into things. 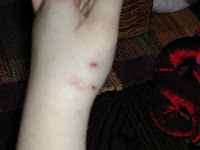 And then there are the scrapes and sometimes even cuts that I never get a call or note about. So what do you do if that happens to your child who can’t tell you what happened? Do you send a note to school the next day asking for an explanation? And what if no one owns up? If your child is supposed to have an aide by their side all day in school, do you accept the answer that no one knows how the injury happened? What recourse do we parents have? At the end of each visit, saying goodbye gets harder and harder. Johnny visited in our home this weekend. It felt very right having him here. It felt like an empty room in our hearts was soon to be occupied. There was boy time - there was alone time - there was Mom time. It all balanced and it all worked. It's time to make a reality out of the whens and soons. It's time for Johnny to move home with us, and stay. And that could happen as soon as this upcoming weekend if his guardian ad litem (attorney appointed by the court for a foster child) stops insisting that Johnny be institutionalized. Yep, I said institutionalized. Why a seemingly intelligent person believes sending Johnny to a 'special school' is better than living with a family that loves him and will take care of him is a question so ludicrous that I can't begin to imagine an answer. A young woman, probably about 19 years old, sat not far away. She had a trach and severe CP. Her wheelchair was a mechanical marvel but she never moved. Every so often her mother would need to suction her, but when she wasn’t suctioning, her mother played with her daughter’s hair – twirling it, running it between her fingers, braiding it. All the while, she gazed lovingly into her daughter’s eyes. In the seats behind us sat a young mother cradling her severely disabled baby in her arms. She rocked back and forth in the ‘baby dance’ all mothers are instinctively bred to do. As she rocked, she stroked her baby’s cheek with two fingers of her right hand. An older gentleman walked toward those of us who waited. He was holding the hand of a young girl whose left arm was bent strangely and appeared to be of little use to her. She struggled to walk but the determination in her eyes said she would not give up. The man and the girl sat down, and the man’s hand drew circles on the girl’s back. She looked up at him and he looked back smiling, never stopping the stroking of her back. The whole time I was watching, I had my hand on Ashley’s arm. I was very gently stroking her arm, almost oblivious to the fact that I was doing it. Every so often, I would weave my fingers into hers, and she and I would exchange a smile. It seems we parents of children with severe disabilities must always be touching our children, almost as if we fear they will slip away if we don’t. The connection binds us together, and holds the unthinkable at bay. It is especially strong for those of us whose children have almost slipped away. Something deep inside, some primal urge to protect, keeps our children’s heartbeats, the warmth of their skin, and the rhythm of their breathing alive on the tips of our fingers. There is no better feeling in the world. So many times in my life, when I have been stressed or down in the dumps, something always seems to happen to reinforce my belief in the goodness of people. Today was no exception. As I’ve talked about before, the main obstacle to my adoption of Johnny was getting a wheelchair accessible van. I’ve struggled for many weeks now trying to figure out how I was going to afford an exorbitantly priced vehicle, but a vehicle I believed I needed to have. Yes, most accessible vans can be financed for 10 years. But the thought of paying about $600 a month for the next ten years appalls me. I believe I have worked out a solution, a solution that doesn’t involve purchasing a van. But the person who contacted me today didn’t know that. Her actions and desire to help me touched my heart and truly did affirm that deep inside most people is a heart of gold. Linda is a person for whom I have designed and managed web pages for almost 10 years now. Interestingly, she and I have never met and never spoken. All our communication has been through email. One day last week, she indicated in one of her emails that she was late getting me some information for a web site because she was having a bad day. I empathized with her because I too was having a pretty rotten day. She told me her story and I told her mine – again, all through email. I’m not going to share her story but mine you’ve already heard, and it was about my feelings of despair because I couldn’t figure out a transportation solution for bringing Johnny home. We bonded over our moments of unhappiness and I believe both of us felt a little better just for having shared our stories. That was that…or so I thought. Today when I arrived at work, I had an email from Linda. She asked me to call her if I could. I was quite surprised but immediately picked up the phone. She told me about visiting her mother in West Virginia over the weekend, and learning that a family that attended the same church as her mother had lost a child the previous week. The child was 12 years old and had, in Linda’s words, severe handicaps. Linda then went on to tell me that the family wanted to honor their son’s memory by sharing all his specialized equipment with other families who had similar children. And Linda immediately thought of me and my need of a van. She called to tell me this morning that the van was available if I wanted it. Linda didn’t know that I had already made other transportation arrangements, but I was so very touched that this person to whom I had never spoken and still have not ever met, would do something like this for me. That is the beauty of human goodness, and when it touches my life, I feel like I am bathed in a shining, warm, golden light. I have been blessed in my life to have crossed paths with some very special people. Linda and the mother who has lost her dear son have now been added to that list, and I hope they know just how much brighter my life is for having met them. That mother has indeed honored her son's memory. And all the people with whom she shares her son's equipment will always know that. And Linda, thank you, thank you so very much for caring. Be sure to check out the other Special Exposure Wednesday shots at 5 Minutes For Special Needs! What little bit of hearing my dear Ashley had is starting to deteriorate. Two years ago, the audiologist recorded a profound loss in her right ear and a severe loss in her left. But, she could still hear loud noises, and seemed to hear the voices of some people, people I think whose tone and cadence she had become accustomed to. She’s always relied a lot on Tadoma, and if a person will get close enough to her, she can also read lips a little. But recently, I’m noticing that she is missing things she used to be able to hear. And the worst thing of all, the few words that she could almost say are now nearly unrecognizable. I can’t remember the last time I heard ‘Gip’, her way of saying her brother’s name, Chip. ‘Hi’ - or her version ‘HUH’ - is seldom uttered anymore, although we do still hear ‘Bye’ pretty clearly. She also will still say ‘Oooh Mae’, her way of saying her dear aide’s name Amy. But the saddest loss? I’m not hearing ‘Mom Mom’ very often, and her ‘I lu’ for ‘I love you’ is slowly slipping away. Yes, she signs all those things. Yes, her signing has improved even as her hearing as deteriorated. But, I’m really going to miss the sweet little voice of my daughter. Maybe I shouldn’t be so sad….but I am. Johnnie met my family for the first time this weekend. We met him and his foster family in a city halfway between our two homes, and then Johnnie joined us for lunch. I had met and visited with him several weeks ago, and we decided it was time for everyone else to meet! Things went well. Johnnie was not quite as nervous as he was the first time I met him, but I believe he was a little anxious to not have his foster family close by. His foster mom had told him that they would be back in about two hours to pick him up, and I noticed him looking at his watch frequently. Although Johnnie has shared with his social worker and his foster family that he is excited to be joining our family, I can only imagine how difficult all this must be for him. I’m sure when he moved in with his most current foster family, he believed it would be his last move. Unlike previous foster placements, this family spoke his language – sign language – and he finally felt like he was home. He called the foster father, DAD, and the foster mother, MOM. He spoke of his sisters, the two younger birth daughters of the foster family. He got comfortable, and was beginning to imagine a future….until things changed. I still don’t know the whole story, but the foster dad is no longer comfortable with Johnnie in his family. I have heard things about the younger daughter having a crush on Johnnie – about Johnnie drawing inappropriate sexually-oriented pictures. But this foster family is a therapeutic foster family. They are specially trained to deal with difficult situations. And the stories I have heard are not even close to the most difficult things that often happen in foster care. So yet again, Johnnie will move. But I will promise him that this will be his last move. I’m sure we may have some rough spots ahead. We all have a lot to learn about living peacefully together. We have routines and skills and idiosyncrasies to which we will all have to adjust. I’m hopeful the good will quickly outweigh the not-so-good, but I think we are all ready for Johnnie to come home. Just three miles from the ‘hospital’ I described in yesterday’s post is another facility. This one has ‘home’ not ‘hospital’ in its name, and that is one of the first indications that things are very different. Although this home is also a facility for children with the most severe disabilities, it’s not a warehouse, not a scary place, not a place for neighborhood children to fear. It is a place where parents and some social service agencies place their children, children who need more care than parents are capable of providing. To me, it seems more like a nursing home, but not the horrible nursing homes that appear frequently in news stories. The staff at this facility honestly and truly care for the children. They make the facility experience as home-like as possible, and go out of their way to provide a lifetime of positive experiences for the children. The attend trainings regularly to stay abreast of the best ways to educate and care for the children in the home. They call in experts in different disabilities, people who can offer ideas for positive change and improved care. 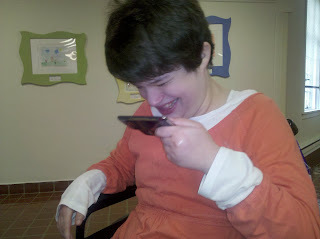 In fact, many of the staff have children with disabilities themselves. To further contrast this home with yesterday’s hospital, let’s go back to the child that passed away. Yesterday I described a callous, uncaring attitude towards the child that passed away. Unfortunately, due to the significance of their disabilities, some children who live in the home have also passed away. But how the staff handles those passings speaks volumes. Not long ago, a child that had lived at the home for many years passed away. His mother was very, very poor but somehow managed to get to the home to visit with her son each day. Even during the heavy snow and with no buses running, the child’s mother would walk several miles to see her son. His passing was an extremely sad event for everyone, including the staff at the home. But, the young man was not rushed away – his belongings were not piled haphazardly in the middle of his stripped bed. Rather, his body was removed with the respect it deserved and his bed was made up, just as it would be every day that he lived there. A white blanket, called an ‘Angel Blanket’ by the staff, was folded across his bed. Then a basket filled with notecards and pens was placed on the bed so staff and friends could come by and write notes to the boy’s mother. 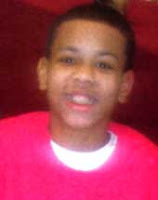 This was a child who was deeply loved and missed. This was a child who was respected. This is the type of facility and the group of people that I would want for my child if they unthinkable happened and I needed to place her there. This is a facility that doesn’t deserve to be called an institution. Rather, it is a home just as its name implies. And I am thankful that such a place exists for those that need it. Just two blocks from the house in which I grew up was a facility with ‘hospital’ in its name. But even as a teenager, I knew this place was different than the types of hospitals where kids visited emergency rooms and women had babies. It was a frightening, dark place, the kind of place where neighborhood children would double dog dare their friends to run up and peak in the windows. And, there was a square cinder block building in the back that we kids convinced each other was a morgue. Long black cars that weren’t limousines could be seen leaving this ‘hospital’ at all hours of the day and night. And I knew instinctively it was a place I never wanted to be. The facility is still there today, over thirty years later, and I now know exactly what kind of place it is. It’s an institution. A place where both adults and children with the most severe disabilities reside. These are people, many of them children, with trachs and on vents. Children who receive school services as they lay in bed, children who never leave their beds for months on end. Some are placed there by the state or locality in whose custody they belong, and some are placed by parents, parents who have no other choice and no ability to care for their loved ones at home. I in no way blame the parents for the choices they were forced to make, but I do blame the operators of the facility for the horrible care, and I use that word loosely, that they provide. At 3am last Monday morning, a child who resided at this facility died. Of course the staff didn’t use that term. The term used by the staff is ‘expired’ – expired like a bad carton of milk, expired like a moldy loaf of bread. And then it gets worse. The child’s body was removed and by 9am that morning, her bed had been stripped and all her possessions had been tossed into a pile in the middle of that bed. While this might not seem like a significant action, to me it speaks volumes about the child’s treatment when she was alive, and the overall lack of respect the staff and the management of the facility have for the people who have been placed in their care. This is one reason that I fight so hard to keep new institutions from being built and from existing institutions from remaining open. From my travels around my state and my knowledge of most of the facilities that exist, the situation I described is not unique. Rather, it is commonplace. There is one place though that is different. Tomorrow I will contrast that place with the facility I described today. I know today’s story has not been pleasant to read, but come back tomorrow and things will be better. I promise. When your day has been overstimulating - when you've had enough - when you can really relate to turtles, and you just need to go into your shell for a while, turtleneck sweaters are a very good thing! I know I've written a lot recently about the frightening and sad state of disability issues in my home state, Virginia. This is another of those posts. Virginia, long recognized as one of the worst states in providing services to people with disabilities, is sinking even further down that list, this time to 49th out of 50 states. Why? Because once again the focus is shifting to putting people with disabilities into institutions rather than in the community. One of our state's newspapers published an Op-Ed column this past weekend from Howard Collum from the ARC of Virginia (formerly known as the Association for Retarded Citizens. That name has been dropped and only the initials are used today). It is well worth your time to read. And please know, what is happening in Virginia may already been happening in your state, or will soon. The state of the economy is resulting in rash and uninformed decisions by legislators forced to produce balanced budgets. We need to all voice our committment to community living for everyone, disabled or not. Our Virginia state government is facing its biggest fiscal crisis since the Great Depression. The economic downturn and the loss of millions of American jobs has dramatically reduced tax revenues that pay for basic government services at all levels - federal, state and local. Our state and local governments can't print or borrow money to solve the problem. State and local budgets must be balanced. The governor and General Assembly members have the responsibility to adopt a balanced 2010-12 budget. While the budget cuts will be challenging, our elected officials need to look beyond short-term 2010-12 budget decisions. There are clear opportunities to reform and remake state-funded services for the future. The Arc of Virginia has been working hard over the past year to have the state step back and reconsider its 2009 decision session to rebuild a 75-bed training center for persons with intellectual disabilities at the Southeastern Virginia Training Center (SEVTC) in Chesapeake. The decision to rebuild 75 beds was made after then-Gov. Tim Kaine had recommended closing SEVTC by June 30, 2009, as part of his budget recommendations. In addition to the rebuild on the current campus, the General Assembly for the first time ever authorized state bonds to finance 90 community beds in the Tidewater and Peninsula communities for persons leaving SEVTC. Subsequent to the rebuild decision, a state-funded review of SEVTC residents by a nationally recognized firm concluded that all current SEVTC residents could be served in community homes. The Arc spent the rest of 2009 meeting with Kaine's Cabinet officials and agency leadership to obtain a deferral of the rebuild until the General Assembly could reassess this issue at the 2010 session. The Arc's efforts to defer the SEVTC institution rebuild were not successful. Our Arc families were shocked by the state's decision because all of the residents can live in the community and because of the financial cost. The institution rebuild will cost $23 million for 75 beds or $306,000 per person to build a house on the campus. Are there no homes available in Tidewater for less than $1.5 million? Meanwhile, the state is funding the building of 90 community beds for $8.4 million or $93,000 of state funds per person. The Arc of Virginia has been on record opposing the SEVTC facility rebuild because it continues and reinforces the stereotype that there are some people with intellectual disabilities who can only be served in institutions. This is simply not true. There is no special class of persons who cannot be served in the community. No other state is going down this rebuild road. In fact, 11 states have closed all their state intellectual disability institutions and shifted to community care. The Arc believes that the growing community wait list problem is tied to Virginia's continuing institutional focus. Today, the average annual cost per person in one of the five state training centers is $194,000. The average cost of care for those in community homes is $95,000. Our families on wait lists don't understand why our revenue-strapped state government is insistent on using our scarce taxpayer dollars to pay three times to build and twice to operate state institutions. The Arc believes the 75-bed rebuild violates the Americans with Disabilities Act's community integration requirement. The Arc felt so strong about this issue that it requested the Virginia Office of Protection and Advocacy to bring legal action in federal court against the Kaine administration last October seeking to stop the SEVTC rebuild. The judge ruled in December that the case was not "ripe" for judicial action as the rebuild had not yet occurred and no one was as yet in it. In a letter dated Jan. 29, The Arc asked Gov. Bob McDonnell to suspend the SEVTC rebuild because of the high construction costs, the high operating costs, the continued segregation of persons due to their disability and the adverse impact on Virginia's future ability to fund critically needed waivers for persons now living with their families all across Virginia. These wait lists are now more than 5,900 persons with no new waivers recommended for the next 21/2 years. It is important to understand that these persons on the waiver wait list meet the same eligibility as the residents of the state institutions. In fact, families "waive" their legal right to institutional care and sit on the waiting lists. Why? They want community care for their sons and daughters, not placement in an institution. The issue is all about the future. The Arc wants Virginia to turn the page and reform its antiquated institutional system and adopt a "community for all" policy. What about the persons now living in the institutions? What will happen to them? The answer is quite simple. These people will move to small community homes with all the individualized supports they need and deserve. How does The Arc know this will work? It is already being done all across the country. In addition, we're already doing it in Virginia and have been doing it here successfully for the past 40 years. Today more than 4,240 persons are already living in community homes funded by the waiver. The 5,900 people on the waiver wait lists are living at home. The 4,300 school-age children with severe intellectual or multiple disabilities attending public school special education programs are living at home. The scary number for The Arc is the 17,000 persons with intellectual or developmental disabilities living at home with parents 60 years or older. These are the persons who will need help in the future as their parents become physically unable to continue as caretakers or die. These families do not want institutional placements for their family member; they want community care. What about the current institution staff? What will happen to them? All the direct care and medical/clinical staff will still be needed. The Arc supports state operation of community homes using existing staff. There are concerns by families about the need for a state-operated safety net. The state can fulfill this role in community settings. If our state government is really the country's best-managed state, it can surely step back and reassess an earlier decision to be sure the public policy and fiscal implications are understood and sound. It is the prudent and common sense thing to do. It takes leadership. The Arc is asking our governor and legislators to provide it. The thought of Ashley having a seizure in the middle of night really frightens me. I worry I won’t hear her – in fact, if the seizure is one of her typical ones, I know I wouldn’t hear her. And when she is sick, the probability of seizures increase, and the seizures themselves can be life-threatening. Until recently, I have had a small loveseat in her bedroom, and when she was sick, I would sleep, or try to sleep, on that loveseat. The reality was I didn’t sleep but I was at least comforted in the knowledge that I would know if something happened to Ashley. But that loveseat wasn’t a good solution because I needed some sleep to be able to care for her during the day. So, I’m trying something different now. I had a spare twin bed and mattress and this weekend I set it up in my bedroom. I by no means have a large bedroom. In fact, my house is pretty old, and was built in an era when house space was relegated to the living room and dining room not but bedrooms. So, I now have my queen bed, the twin bed, two large old dressers and a nightstand all jammed into my bedroom. Even though I have to walk sideways to move around the room, I feel so much better knowing that Ashley can sleep on the twin bed and I can have my bed in the event that she is sick. How do you handle a similar situation? Have you made special arrangements for the times that your child is sick? Or for those of you who have children who are medically fragile, how do you monitor your child on a night to night basis?